Ahhh yes! The hoodie. Is there anything that this wondrous piece of affordable apparel can't do? It's ingenious design, which is not too hot, not too cool, allows you to keep warm during chilly autumn weather, while still being casual enough to wear any time of the day. You can wear it indoors and outdoors. Heck, it even makes you look kind of tough when you put up the hood and now, with this Bare Bones Glow in the Dark Hooded Shirt, it adds a couple more things on to that roster! This hoodie has a printed bone designs on the front, making it the perfect costume to wear when you want to look like a walking x-ray photo, or if you just want to freak out some of your friends. 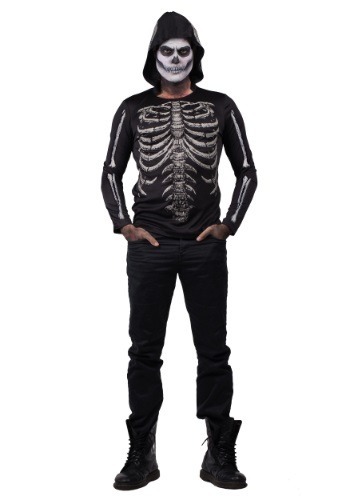 Of course, the printed patterns glow in the dark, so it also a glowing effect during the night time, so you can surprise night-time party-goers with your clearly visible bone structure.